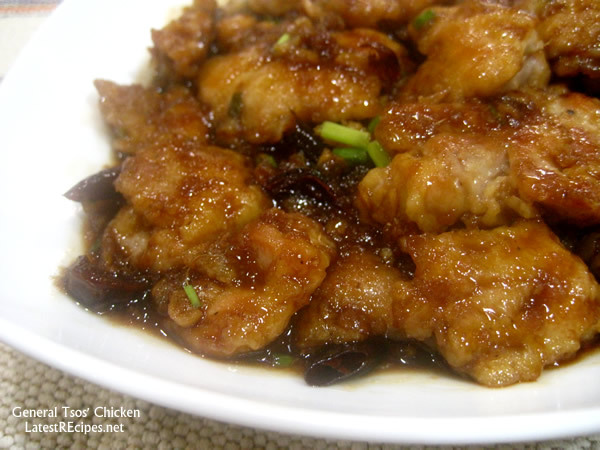 This is a very popular Chinese dish but I have never tasted it until I tried to cook it at home. I have eaten in many Chinese restos here but I have never seen this on any menus or maybe I just didn’t browse long enough to find it. Anyways, it is delicious as I expected it would be, I like this kind of dish- coated/battered meat, fried and cooked with savory sauce..yum! You may choose to deep-fry the chicken pieces, I prefer pan-frying since I don’t want to use too much oil for just a few ounces of meat then discard it eventually ’cause I don’t like re-using oil. Put the chicken pieces in a deep bowl, with salt and pepper then add beated egg and cornstarch; mix well to evenly coat chicken. Heat 3 tablespoons (or more) of oil in a frying pan over medium high heat; add chicken pieces when oil is hot, cook until chicken pieces turned light brown on both sides. Using a slotted spoon, take chicken out of pan; drain the excess oil by laying the chicken on a dish lined with paper towels. Discard excess oil from the pan but leave about a tablespoon, if you don't have any oil left in the pan, then add about a tablespoon of oil, when it gets hot enough, saute the minced ginger, garlic, and dried chilies and stir-fry until you smell the spicy aroma of the chilies. Pour the sauce into the pan. When the sauce boils and thickens, add the chicken, stir to combine well with the sauce. Add the scallion and stir a few times, dish out and serve immediately.